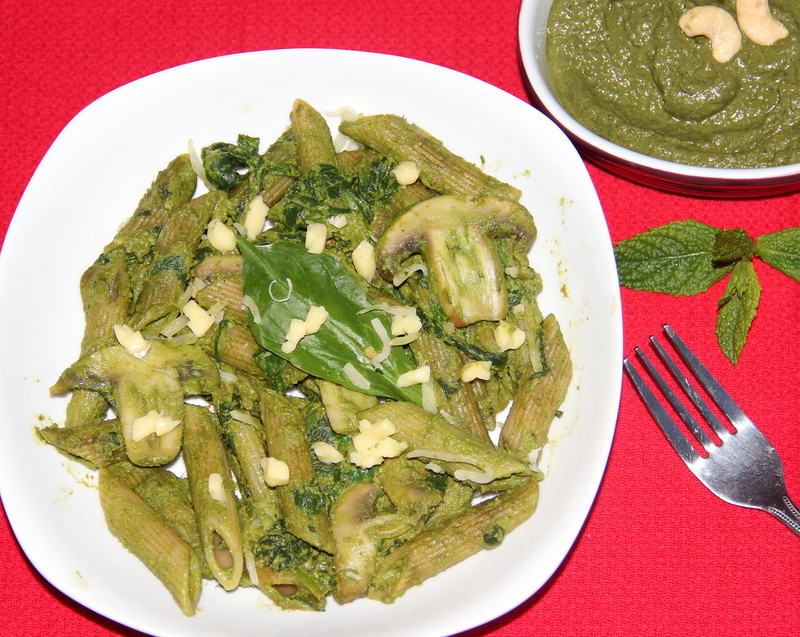 Pasta Tossed With Mint Pesto, spinach and Mushrooms . Mushroom and Pesto Pasta recipe for you to cook a great meal for family or friends. Pasta with mushrooms in pesto sauce is a simple, easy to make, yet extremely delicious Italian dish. As with most pasta dishes, the sauce is made while the pasta is cooking. This dish can be ready in 10 to 15 minutes. Bring enough water to boil in a saucepan, add pasta, salt and cook until al dente. Once cooked drain water add 1-2tsp olive oil mix well to avoid sticking each other. Add in spinach cooked pasta, pesto mix well simmer until heated through. Turn off the flame and sprinkle cheese. Transfer to the serving dish and enjoy. You can just mix pasta to pesto and enjoy. Posted on September 1, 2014, in International, Main Course. Bookmark the permalink. 22 Comments. Oh dear…I was definately missing your feedback…Hopefully will get to see loads of feedback today :)….. This has a lot of my fave ingredients. Yum! It looks gorgeous – I love pesto variations. Thanx Corina for your lovely words. …have a lovely day…..
Oh yum, mint pesto is so delish. The addition of mushrooms sounds great.